Johan Victor Aarne (1863-after 1920) was a Finnish workmaster for Fabergé from 1891. 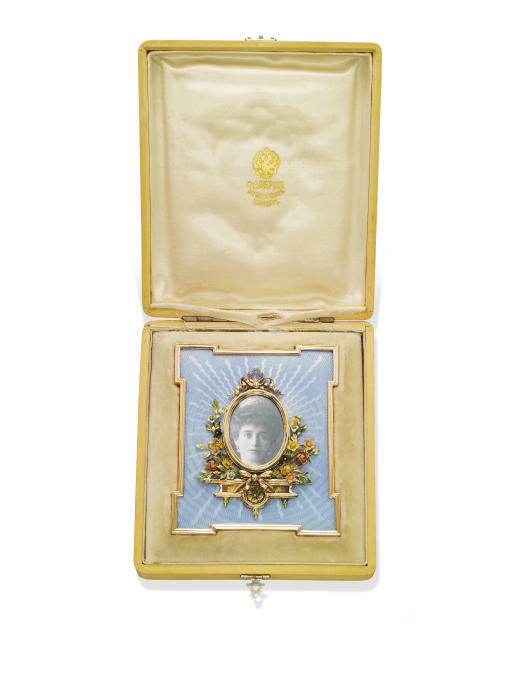 He was known for his enamelled gold and silver articles, and specifically for enamelled frames, such as the lot offered here, with delicate and fine applied goldwork. It is hardly surprising to find such a beautiful Fabergé object in the collection of Princess Katharina Henckel von Donnersmarck. While her jewels represent the highest quality from the French houses such as Boucheron and Chaumet, this delicate frame reflects the Princess' exquisite taste for craftsmanship together with her own Russian heritage. Jewels from the Private Collection of Princess Katharina Henckel von Donnersmarck will be offered as lots 388-396 at the end of this auction.